Administrators can control what membership information appears by default to the public and other members on member directories, forum posts, and blog entries, and whether member photo albums are visible to other members and non-members. Individual members can override the default privacy settings and choose for themselves what information appears to the public and other members. If you don't want members to be able to override the privacy settings you have chosen, you can lock the privacy settings for individual fields. You can set the privacy defaults for future members, and optionally, apply the changes to all existing members. On the screen that appears, click the Edit button to enter edit mode. 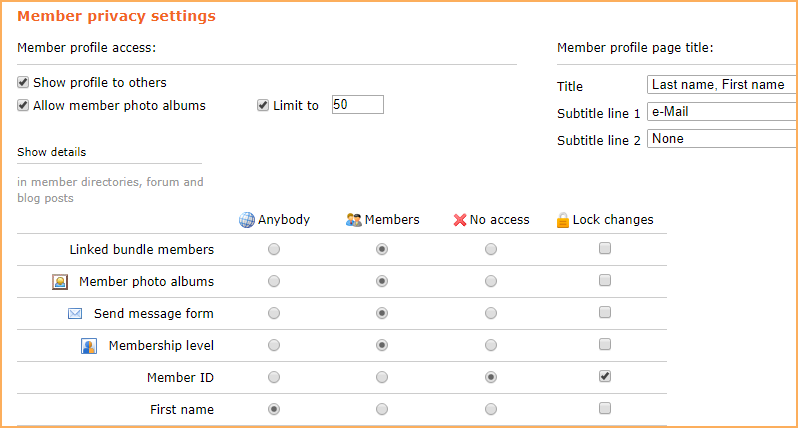 In the Member profile access section, you can control access to member profiles. If you uncheck the Show profile to others option, then members will not be listed in the member directory, and visitors will not be able to jump to a member's profile by clicking their name within the directory. 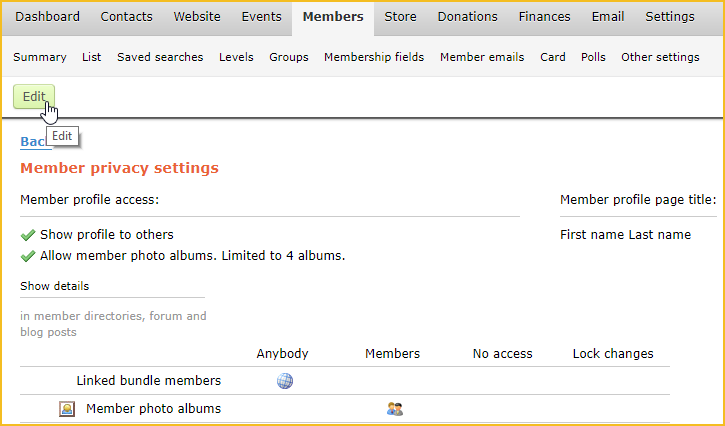 If you uncheck the Allow member photo albums option, then members will not be able to create member photo albums. To allow member photo albums but limit the number of albums that members can create, check the Limit to checkbox and enter the maximum number of albums you want to allow. In the Fields to use as page title section, you can control how members are identified within the title of their member profile. 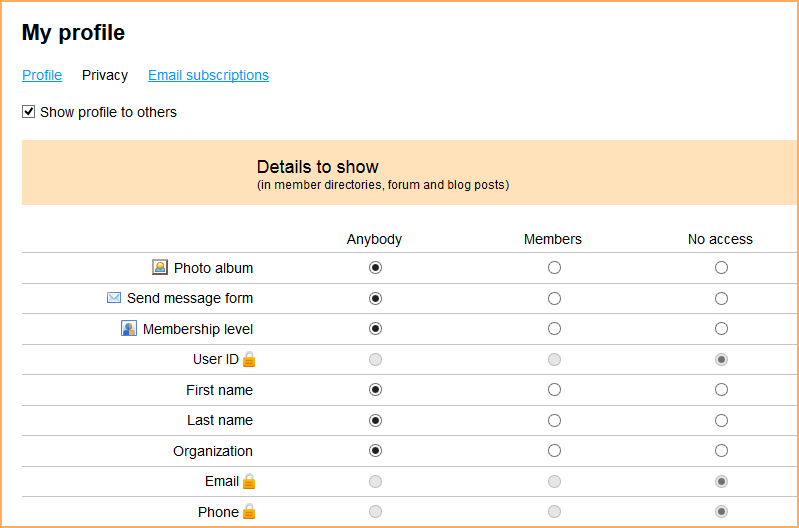 In the Show details section, choose whether member photo albums, and information stored in individual contact fields and membership fields, will appear to anybody, to members only, or to no one other than administrators (and the member him or herself). If you've set up a bundle membership level, you can also control whether a list of fellow bundle members appears within each bundle administrator's public profile. If you don't want individual members to be able to override your setting for a particular field, click the Lock changes checkbox for that field. Members will be unable to change the privacy setting for that field within the Privacy tab of their member profile. To add or remove membership fields, click the Add or change fields in database link at the bottom. When you are finished adjusting the privacy settings, click the Save button. You will be asked whether you want to apply these changes to existing records as well as new records. If you only want to apply these changes to new records, click the Leave existing records alone button. If you want to apply these changes to all existing records as well, click the Apply to all records button. If you choose to apply the changes to all existing records, you will be asked to confirm the request by entering the word REAPPLY in the field provided. After entering the word, click the OK button. You can change the privacy settings for individual members without affecting the settings for other members. Go to the Contacts module and display the contact's record. Click the Edit button to enter edit mode. In the Profile access section, you can control access to this member's profile. If you uncheck the Show profile to others option, then the member will not be listed in the member directory, and visitors will not be able to jump to the member's profile by clicking their name within the directory.. In the Show details section, choose whether the member's photo albums, and information stored in contact fields and membership fields for this member, will appear to anybody, to members only, or to no one other than administrators (and the member him or herself). You can also control whether member photo albums will be visible to members and other visitors to the site. If the member is a bundle administrator, you can also control whether a list of fellow bundle members appears within the bundle administrator's public profile. When you are finished adjusting the member's privacy settings, click the Save button. From their member profile, members can change their privacy settings. Logs into their Wild Apricot account. Clicks the View profile link to view their member profile. Depending on the theme, their name may appear as the link. The member can now choose who can view their personal information. If a lock icon appears beside a field, the member cannot change the privacy setting for that field. Once they are finished changing their privacy settings, the member clicks the Save button. Normally, blog topics and forum posts will identify the author using their first and last name. If the author is not a member, or if the author is a member whose profile has been hidden – the Show profile to others option within their privacy settings is unchecked – then they will be identified as Anonymous. If both their first name and last name are hidden to the current visitor, they will be identified as Anonymous member.